Everyone wants their websites to be SEO friendly . Efficient Search Engine Optimization(SEO) helps to increase your page rankings and the end result is web users viewing your website. But SEO is no magic wand that one waves; it’s not like pulling a rabbit out of a hat. It is absolutely necessary to understand how and why it works. Before that let’s try to label the components that go into making a website online. Domains have always been associated with plots of land. People buy domains and sell them with an intent of making profits. In other words, domains are considered to be the real estate of the internet. Top Level Domains (TLDs) form the very foundation of your website because they are used in URLs to identify the web page. Keep that analogy aside for the moment and assume that your website is a feature film that needs to be screened. A theater is the most obvious venue that comes to your mind in order to screen your movie; a no-brainer. Thus, the cinema theater is nothing but your web hosting service. A web hosting package is what gives your website space on the internet and web servers are what keep it up and running. 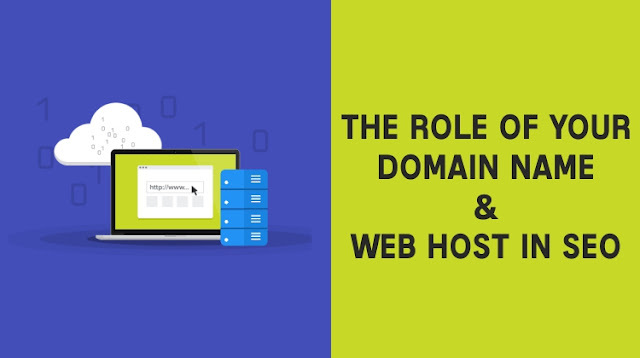 Your website and the domain concerned with it are practically useless without an efficient web-hosting package. Now that you know the gist of what puts a website live on the internet, let’s look at it from another angle. You need to decide how you want people to find you on the web. SEO is one of the last things to be neglected. It aids in keeping your website on a high priority when it comes to search engines, inevitably increasing the number of visitors on to your website. A Second Level Domains (SLD) is the text that comes right before your gTLD (say a ‘.com’) in the URL structure. You will be surprised to know the various factors that are involved in keeping your website URL SEO friendly. ◈ Relevance – The domain name associated with your website must be in context with your professional establishment or whatever may be the purpose of the website that you have created. SEO specialists prefer to purchase exact match domains, which are meant to match the preference of keywords that inputted by internet users. For example, if an NGO wants a website up and running exclusively for stray animals to be put up for adoption, it should ideally purchase a ‘www.adoptastray.ngo’. Search engines have no trouble in filtering out words that have no spaces in between (like the above example). Hyphens and underscores count as alphanumeric characters and not word spaces. Therefore, they must only be used when it is necessary to separate words. Also keep in mind that excess hyphen use could come across as spam for search engines. ◈ Length – The shorter and concise the domain name, the better. You wouldn’t want to keep one that is pointlessly long because people show a tendency to click on shorter URLs (say bitly links that you come across on social media) than those long, nasty ones. Long URLs could also lower your Search Engine Ranking. ◈ Easy to remember – Once you’ve kept the above pointers in check, make sure you incorporate easy to register words that do not take much time for web users especially your customers to recall. ◈ Defensive Registration – Businesses register multiple domain names that are relevant with their products or services to ensure that they are not registered by others and used for their own purpose. Keeping the domain – real estate analogy in mind, think of it as a form of aggressive expansion. From a business point of view, it is essential and not really an SEO tactic. ◈ TLDs – The introduction of the new gTLDs was to help internet users associate the same with the functionality of a website. For example, people know that a .tv will be about a sitcom or any television show in general. .BEER will be for brew fanatics and beer lovers. New gTLDs do not directly influence positive SEO. Although Google is indifferent to gTLDs by themselves, it highlights all the search keywords that are a part of the URL. Say you own a website www.fitness.club and the search includes ‘fitness club’ then the chances of your search engine ranking is definitely higher. In spite of ‘club’ coming after the dot, it is still highlighted because it is recognized as a keyword in this case. If you are planning to purchase a domain from the after market, be pragmatic and consider if it is worth the purchase. One of the most important factors to consider is if the domain name that you are wanting to purchase gives a good brand association. ◈ Uptime & Downtime – Uptime refers to how long your website is online and active because of your hosting provider. The most obvious criterion you would need from your hosting provider is to stay live and running on the web 24×7. If you have an e-Commerce website, even 99% uptime could make you lose out on customers. Downtime refers to how long your is unavailable. Another factor that affects your search engine rankings is web site availability. Search engines and especially Google don’t like to redirect their users to websites that are not available. ◈ Website speed – Search engines have now made page load speed into their over all ranking algorithms. In other words, search engines prioritize websites according to the their overall loading speed and is thus crucial for your search engine ranking. ◈ Easy SEO features / Plugins from the host – If your web hosting provider offers you Content Management Systems like Softaculous or WordPress which are well tuned for SEO, it could be advantageous to opt for them and use them to help you boost your search rankings. ◈ Type of Web hosting package – Shared hosting is the cheapest available package but is least efficient from the perspective of SEO. That’s because websites hosted on a shared hosting server share a common IP address. This could obscure your search engine visibility and thus decrease your rankings. The other option is to choose a VPS hosting where you basically pay to have your own server, thus having your very own IP address with dedicated resources and isolated from any other websites. Now that you understand the various components of a website and the impact it provides to your SEO, you don’t really need a magic wand or rabbit out of a hat.